Close up of an attractive Caucasian golf player in glasses making a hit with a club and then watching his result. Good sunny weather. Outdoors. Portrait shot. Portrait of a handsome Caucasian man in glasses playing golf. 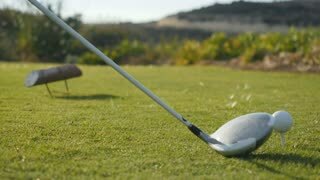 Golf player making a hit with a club. Nice sunny weather. Outside. Close up. Handsome Caucasian golf player getting ready and hitting a ball with a club on a summer weather day. Outdoor. 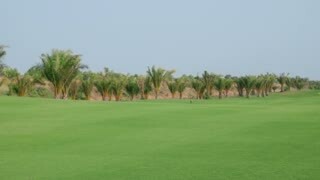 Golf field.